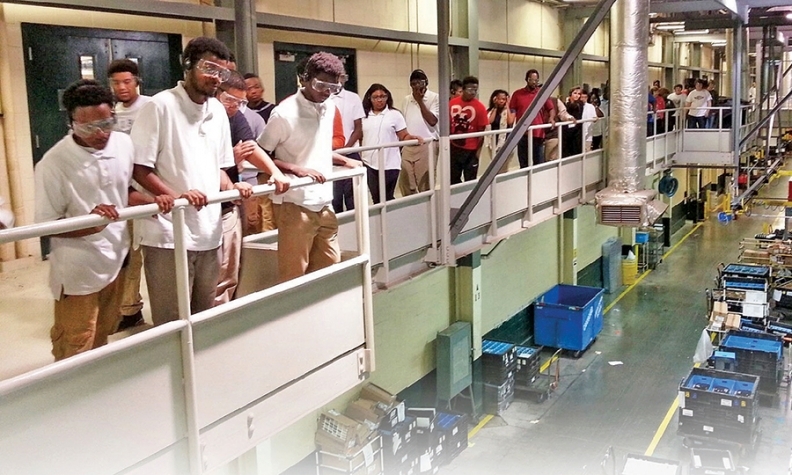 Honda invited high school students, above and below, to its plant in Lincoln, Ala., to get them to consider working there in the future. LINCOLN, Ala. -- What is it with kids these days? Automotive jobs are going begging, causing automakers, retailers and state governments to search for creative ways to attract young people to the industry. They need to. The U.S. Bureau of Labor Statistics anticipates the auto industry, including dealerships, will have tens of thousands of jobs to fill in the next several years -- for new plants, for operations in far-flung locations and even in the U.S. industry's traditional ground zero, Detroit. Picture this: Managers from Honda Motor Co. this month invited local high school students into their light-truck plant here to get young minds to consider someday assembling Pilot SUVs and Odyssey minivans for a living. Other automotive companies are making similar efforts. That's because the youth of America seems to be uninterested in working in the auto business -- one of the nation's most rewarding employment fields for the last century. But the industry is yearning to hire young people for assembly lines, engineering departments and vehicle repair centers, says Mike Oatridge, vice president of manufacturing at Honda Manufacturing of Alabama. Honda's most pressing need at the moment is people who understand how robots can network via Wi-Fi and Bluetooth -- exactly the sort of skill set that would come naturally to a generation weaned on iPods and cellphones. "As a company -- and as an industry -- we've always relied on the fact that people just know what jobs we have here and that they'll come to us as we need them," Oatridge says. "That's not really happening now. "People are getting the message that they need to grow up and be a dentist or work in the media," he adds, with a touch of defensiveness in his voice. "The auto industry has good jobs." Why the disconnect? It's a tangled knot of image issues, changing cultural attitudes and just a big wave of lousy timing. Young work-force entrants aren't as familiar with, or open to, the notion of working in factories and mechanical shops as their parents were. And for most of the last decade, that hasn't really been a problem. The U.S. market downturn that began spooking the industry in 2007 resulted in years of layoffs, downsizing and diminished recruitment efforts. Last year, the Bureau of Labor Statistics reported that less than a tenth of U.S. automotive workers were younger than 24 -- while two-tenths were older than 55. The number of automotive workers still on the clock past their retirement age of 65 is twice the number of those younger than 20. Such mathematics might be OK for a stagnant business. But the auto industry is roaring in 2015. And early forecasts for 2016 call for U.S. new-vehicle sales to exceed this year's 17 million-plus pace. Automakers are struggling to meet consumer demand, and supply chains are scrambling to keep up. Yet all through the automotive pipeline, down to new-car showrooms and independent repair garages, employers are fretting over how they will attract young workers for the next 10 to 20 years. "Younger people are used to video games and virtual reality systems," observes Kim Williams, vice president of manufacturing & quality for CalsonicKansei North America in Shelbyville, Tenn. "And we have that in some of our plant tools now. We need those people. "Our plants are clean and well-lit. We have an electronics plant that's a clean-room environment, with white floors," she says. "The work involves 3-D modeling and technology and design. It's not your dad's factory anymore. We just need to get that message out." It isn't just about today's immediate needs -- it is a longer-range question of what the companies are going to need in 20 years. A skilled 40-year-old hired today will be nearing retirement in 20 years. Leah Curry is vice president of manufacturing at Toyota's big plant in Princeton, Ind., outside Evansville. When she is not busy overseeing the 5,000 people who stamp, weld, paint and assemble Highlanders and Sequoias, Curry is on a new mission: encouraging young people to work at Toyota. Two years ago, she championed a program with the State of Indiana to take representatives from various manufacturing companies into local schools to tell students what the work is like. They told the young people how much manufacturing jobs pay and showed videos of Toyota engineers and maintenance workers explaining their jobs. "We work with the kids in classrooms to tell them what we do here," Curry says. "It's a continuous awareness program, built around the skills we need." The plant also has started offering paid maintenance internships for people just coming out of high school. Four of those students already have moved into a Toyota engineering program. Over the summer, Toyota expanded the program to welcome interested teenagers before they begin college. "I have nieces now," says Curry, who grew up in the agriculture-heavy belt where she now manages Toyota's truck plant. "They say, 'I want to be an orthopedic doctor' or 'I want to be a teacher.' They don't say, 'I want to be in automotive.' They don't say, 'I want to be in the factory' -- because it doesn't sound good to them. They can be an engineer in automotive, but they don't know that. "Nobody talks about being an automotive technician," she protests, "and they can make $100,000 a year!" So, Curry says, manufacturers are trying several tactics to attract young people. That includes running work-force promotional ads before movies at local theaters. This year, it dawned on Curry that Toyota was not making any effort to reach out to the children of its own work force. She changed that. The automaker brought its first wave of team members' kids in to tour the plant and offices to simply see what goes on there. The sight of animated school kids watching the plant robots and stamping presses with wonder triggered more interest from other employees. "We did the first group, and people said, 'Hey, I have a child, too -- can my child come in and talk about working here?'" Curry reports. "We've started running announcements over our plant TV system to encourage parents to tell their children." To make the student visits easy, Toyota schedules them for after school hours. That idea was a suggestion from one of Curry's new teenage interns. 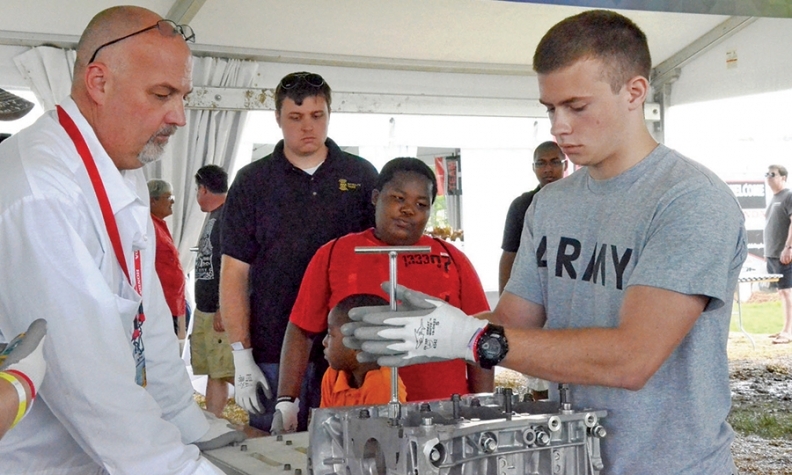 Honda's tent at an IndyCar event let kids test their skills on factory workstation equipment. The industry's efforts stem from a growing concern that the demographic pig is moving through the python, as social scientists say, and there will not be enough new workers to replace those retiring in the coming decade. Not only are young people reluctant to consider automotive work, but this cultural phenomenon is percolating at a time when the industry needs to expand -- not merely remain at current levels. Set aside for a moment the issue of young vs. old employees. The Bureau of Labor Statistics estimates that by 2022, the industry will need 60,000 more auto mechanics than it employed in 2012. Just since summer 2014, U.S. auto service and repair shops increased their head count by 37,800 workers, according to bureau estimates. It estimates that automotive factories have increased employment by 46,000 workers since August 2014. Randy Jackson, senior vice president of human resources and administration at Kia Motors Manufacturing Georgia, tallies it up this way: Kia has 8,500 direct employees and on-site supplier personnel at its plant campus in West Point, Ga. There are 15,000 people total throughout its supply chain in the area. Jackson frequently goes out to talk to students about what goes on inside Kia, and he encourages other managers from the company to do the same. "My work force is going to turn over two or three times over the coming years," says Jackson, whose own ambition as a child was to become a dentist. "When I look at the people I'll need to hire in 15 years, they're probably sitting in kindergarten right now. The people I'll hire in 10 years -- they're in sixth grade. "So many kids want to grow up and play in the NFL," he says. "And college is a great thing, and it's good to have a dream job out there. But if we can reach young people before they spend four years in college pursuing something that isn't realistic, we might be able to open their eyes to something they will find very rewarding." Nor is this challenge unique to international automakers such as Kia and Toyota, which built U.S. plants outside old, established auto industry corridors. A work-force attitude study released last year by the Detroit Regional Chamber reported that just 39 percent of Michigan youths surveyed said they would consider a career in automotive. And just 41 percent of their "influencers" -- such as parents and teachers -- said they would even recommend a career in the industry. This year, the State of Michigan launched a campaign to attract more young people into the industry. The initiative, called "We Run on Brainpower," is aimed at young people entering the work force in engineering, technology, telecommunications and other fields. It aims to convince them that the Michigan auto industry will reward them as much as more fashionable jobs in Silicon Valley or other high-tech Sun Belt regions. Fiat Chrysler Automobiles this year took the step of saying it will pay for a college education for dealership workers. The program, which pays the cost of all tuition, books and related expenses to receive a degree from the national online college Strayer University, will roll out to all of FCA's 2,600 dealerships in the fourth quarter after a four-month pilot in the Southeast region. The offer is open to current dealership personnel. But in a May press release, Al Gardner, the automaker's head of dealer network development, added, "It will certainly help us attract and retain strong talent." At Honda, Mike Oatridge believes young people still like automotive jobs -- but only after they understand what they are. One weekend in May, the Alabama operation gathered some of its plant managers, dressed in their characteristic white Honda uniforms, some representatives of Honda's Alabama suppliers and a couple of people from nearby vocational schools to attend an IndyCar racing event at Barber Motorsports Park outside Birmingham. Honda parked some of its own race cars on the grounds and erected a large tent. Inside were factory workstation mock-ups, welding machines and information booths. Oatridge says at least 3,000 people passed through the tent, where children as young as 6 were invited to test their skills at shooting bolts and assembling modules. Teenagers competed to see how fast they could torque an engine. There were engine bearings to work on and robotic equipment to handle. Parents were given brochures to advise them on what skills their children should focus on if interested in work at Honda. Oatridge says the display was mobbed. "Parents told us they just never knew this is what goes on in the plant," he says. "Many of them were shocked. People told us they had no idea we did this kind of work in Alabama. "I don't think people understand the manufacturing field anymore. But we're starting to change minds -- and tell people that you can find work here that you can be proud of."